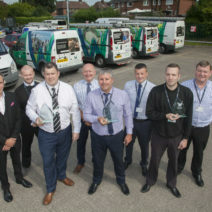 Wythenshawe Community Housing Group (WCHG), are proud to have been awarded the prestigious ‘Innovation in Gas Safety’ award for our pioneering and professional way we manage gas safety to over 14,000 homes in Wythenshawe. We were also awarded the Silver award for ‘Outstanding Performance, Customer Service and Technical Competence’. The awards are aimed at recognising outstanding performance from Morgan Lambert's Independent post inspection quality audits which are completed on a national basis for over 100 landlords. The results derive from over 44,000 post servicing quality audits completed between 1st April 2015 and 31st March 2016.